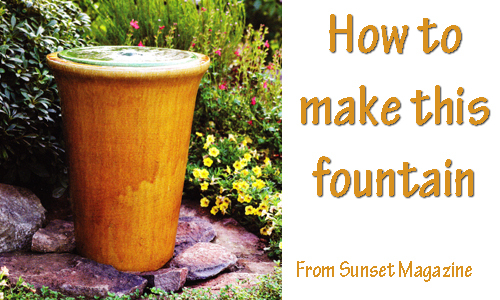 How To Make A Fountain Out Of A Garden Pot! Everyone knows that the sound of running water is comforting & soothing. You can take a garden planter and turn it into a recirculating water fountain by following these easy steps. Submersible fountain pump that lifts water at least 3 feet. 1 - 2" square of sturdy expanded steel mesh. Step 1: Dig a hole in the soil deep enough to hold the plastic bucket. Using tin snips or a drill, create a 1/2" notch in the bucket rim. 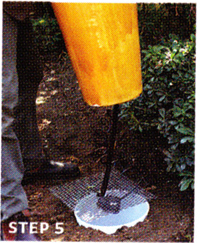 Put the bucket into the hole with its rim at ground level. Set the pump in the bucket. Step 2. Using tin snips, cut a square opening about 1/2" across in the center of the mesh square. Step 3. 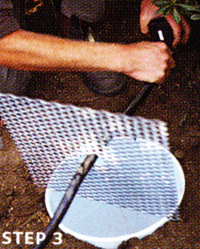 Attach the plastic tube to the pump, then thread it through the center opening in the steel mesh. Position the mesh square atop the bucket. Pull out the free end of the pumps power cord, position so it exits the bucket through the cut notch. Step 4. Slide the plastic tubing's free end throught the drain hole of the large pot. Step 5 - Center the large pot atop the stell mesh and slide it down the tubing until it sits firmly on the mesh. Step 6 - Put a bead of silicone caulk aorund the inside of the outer container. 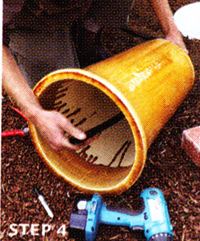 Slip the shallow bowl into the outer container, fitting its drain hole over the plastic tubing, trim the top of the tube so that its end is fluent with the bottom of the shallow bowl. 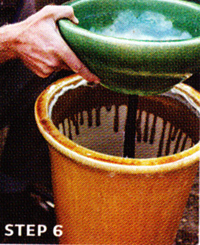 Make sure the bowls rim has good contact with the caulking and allow to dry overnight. Step 7: Put landscap rocks around the pot to hide the mesh and fill the plastic bucket under the fountain with water and turn on the pump. Read more.....Create an Autumn Porch.